An ideal shadow vessel that’s waiting to happen. This 2016 De Hoop expedition craft measuring 181 feet, powered by a pair of Caterpillar 3516 HP engines in an electric hybrid configuration, is very fuel-efficient. She can reach a top speed of 22 knots, and cruise at 12. This vessel is ready to convert. 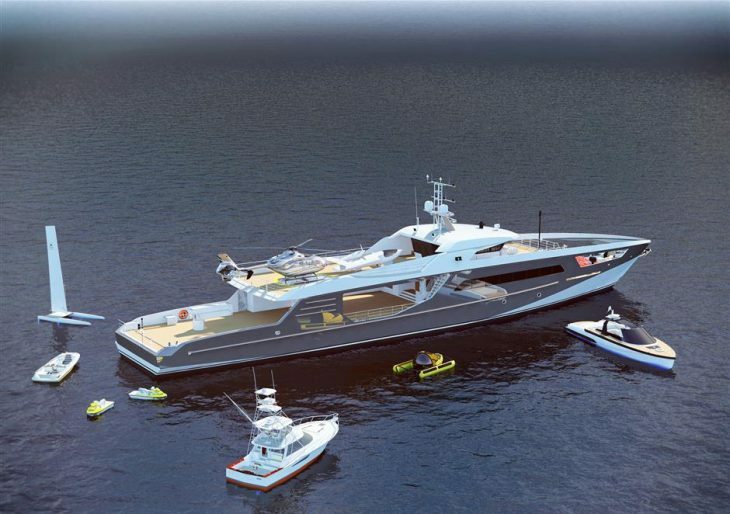 Shadow vessels are increasingly in demand as superyacht support craft. In the past few years they have transitioned from obscure big-ticket superyachting accessories, to virtual necessities for superyacht owners. They provide storage for large water toys, helicopters, sport boats, and both critical and non-critical supplies. This one boasts a classic axe bow, has a thirty-foot beam, and can take a 200-ton deck load. Enough to carry all the auxiliary craft needed for lengthy periods at sea. The potential for extended voyages without pulling into port is increased dramatically by the fuel capacity of this support vessel. The full complement of up-to-date communications and navigation equipment includes a NAVIS DP system with combined console for forward and aft navigation and control, all being offered at $7.9 million.